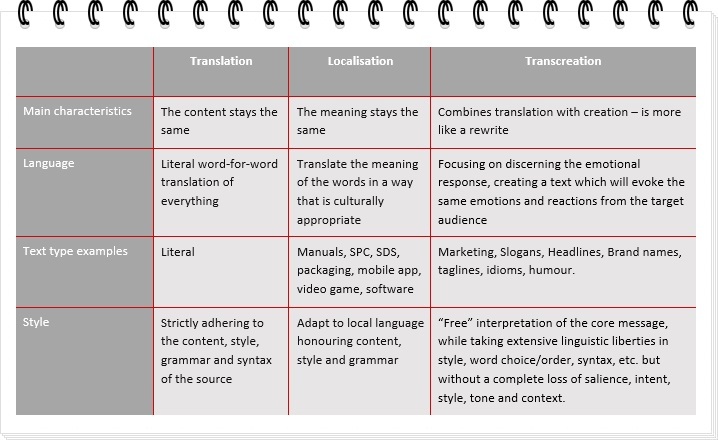 Translation is a faithful and accurate adaptation of your text and is basically the literal interpretation of content from a source language into a target language, strictly adhering to the content, style, grammar, and syntax of the source, without any linguistic deviation from that source or any cultural adaptation of the target content. Sometimes, you only need a quite literal translation just to understand the content of a text, and therefore you do not need the translator to do a lot of work on the target text. In this case you should choose our translation services. If your company wants to attract customers globally, manuals, SPC, SDS, pack copies, etc. would need to be localised rather than “just” translated in order to target your potential customers in a specific foreign market. Depending on the product, the local legislation may also require that your material is translated as well as localised, i.e in connection with Safety Data Sheets for chemical products or building materials. If you are converting scientific or highly technical materials into another language for a professional audience, you most likely will want a direct translation. When working with more nuanced materials where you want your message, brand and “voice” to be understood, such as with marketing or advertising collateral, and some websites or publishing materials, then transcreation is the right choice. Transcreation is ideal for content such as ad copy, slogans, headlines, tag lines or specific language elements like puns, idioms and humor. It is difficult for these types of content to retain their meaning and emotional intent when changing between languages. Let us know exactly what you need so we can provide you with a price that matches your needs.